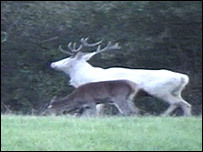 The shooting of an extremely rare white stag has been described by South West farmers as "disgusting". The animal's carcass was found headless after being shot by a poacher on the Devon and Cornwall border. Farmers and gamekeepers had kept quiet about the stag's whereabouts for years in an attempt to protect him. Warrener Pat Carey, whose job is to cull red deer in the area, said there has been a spate of poaching in the area in the past few weeks. Mr Carey, who has filmed the white stag many times during the rutting season, told BBC News the magnificent animal was "sacred" in his view. "There are so many red deer and they do need to be controlled, but to go and shoot this creature is beyond words," he said. "It's got to be a heartless person to be able to look at that beautiful creature through the telescopic sight of a high-powered rifle and just end its life." It is thought the poacher may have sold the head and antlers of the white stag, which is thought to have been about nine years old.